Doc Martin will end after series nine next year. Martin Clunes, who plays the blood-fearing titular character, informed RadioTimes.com that the upcoming series of the medical drama will be the second-to-last. While we’re glad that the upcoming series eight, which begins filming in spring to air later this year, will not be the last – we’re still devastated to hear a much-loved series is coming to an end. Series nine will likely film in early 2019 to air later that year. Clunes has starred in the series since 2004. It is is about a brilliant vascular surgeon who is shunted into a GP job in a sleepy Cornish village after developing a fear of blood. His grumpiness and exasperation with the locals became a basis for seven series of drama and warm humour. The cast of the series are reportedly delighted by the news, because they feared an extravagant wrap party after series seven might have meant the show was over. Bert Large actor Ian McNeice told The Mirror: “At the end of the series we had a wrap party with the best drinks and food ever and we were thinking this is looking pretty – is this a goodbye? We were getting a little nervous. 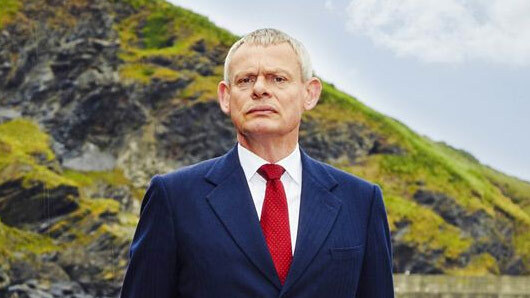 Doc Martin will return later in 2017.